In the world of internet writing, the currency we operate in is clichés. How about this one, “Don’t cry over spilt milk.” I mean, seriously, is there anything more tragic than spilling milk or crying over it? Or how about “Selling like Hotcakes.” If memory serves, I spent an entire podcast episode outro riffing on this statement (where I’m certain something terrible befalls Uncle Ben). Oh snap (is that a cliché too? ), I totally went there, didn’t I? But it’s not without cause or reason. Seriously, regardless of how trite and awful that expression is (just writing that semi-satirical intro made me want to claw my eyes out and cut my fingernails so short as to never be able to type again), ASM #225 will forever and ever be the Spider-Man comic book in my collection with the halfway decent story despite the fact that it has one of the stupidest, most unenticing covers imaginable. No, this is not a slight against the art of the always great John Romita Jr., nor is this sentiment event rooted in my disgust of that obnoxious “Win a 10 Speed Bike” advertisement that’s bannered along the top of the book. Rather, it’s just reflective of my very honest reaction to the first time I ever laid eyes on the cover’s central character/villain. In short: what the heck is Spider-Man doing fighting a pirate? Seriously, should I have thought differently of this comic the first time I saw it? Did you? 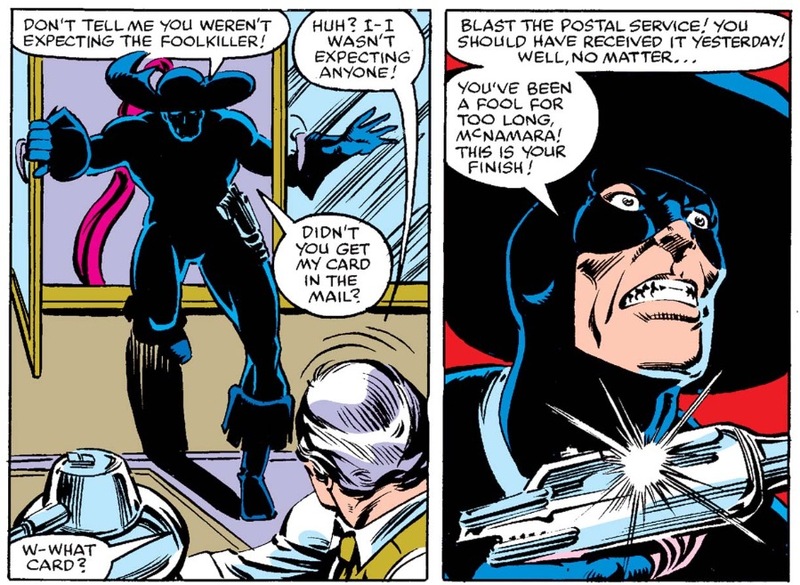 Maybe if I was some kind of Marvel savant (or at least as knowledgeable of all things Marvel as I am now), I would have recognized the guy as a villain going around calling himself the Foolkiller (as the issue describes, prior to ASM #225, he had tangled with the Defenders). 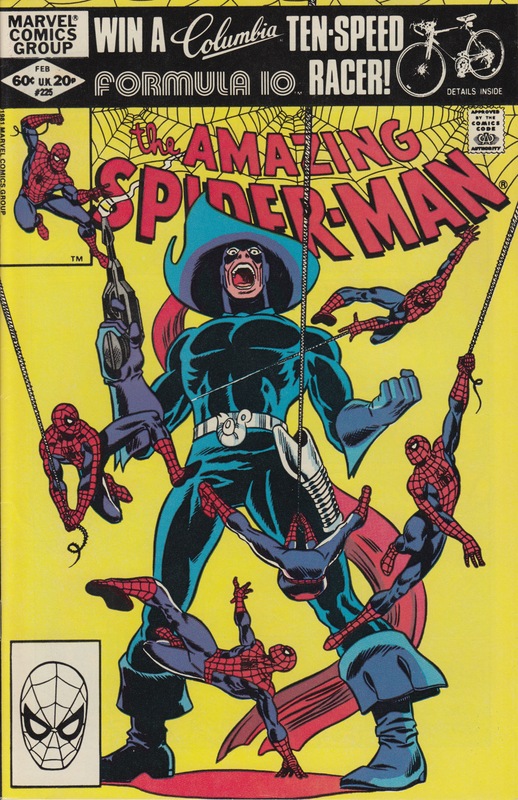 But even with some of this knowledge, it’s not like (as far as I know) the Foolkiller is some kind famous Marvel villain who has tormented the likes of the Avengers or the X-Men and was now making his way over to a Spider-Man comic for the first time (which is something the book’s writer Roger Stern, would do often and successfully during his storied run on ASM). No, he’s just a dude who looks like a swashbuckling pirate, and prior to cracking open my copy of ASM #225 for the first time, I had no context or understanding as to how and why he was fighting Spider-Man unless it was one of those one-and-dones where Spider-Man found himself on the high seas (which, he kinda already did a handful of issues earlier during the Denny O’Neil run). Because of this close-minded attitude, I actually never read the comic until only a few years ago when I was doing a more thorough chronological read-through of all things Spider-Man (like you do), making sure I didn’t skip any issues this time around, regardless of how awful I perceived them to be (this included doing things like reading the entire “Clone Saga” even the really, really bad parts, but that’s not relevant to this post). I had read the issue that preceded this one, the first of many great Stern-spun Vulture stories, and the one immediately following ASM #225 is Stern’s awesome two-part Black Cat arc (which is arguably the best story featuring Felicia Hardy). So how bad could ASM #225 honestly be? 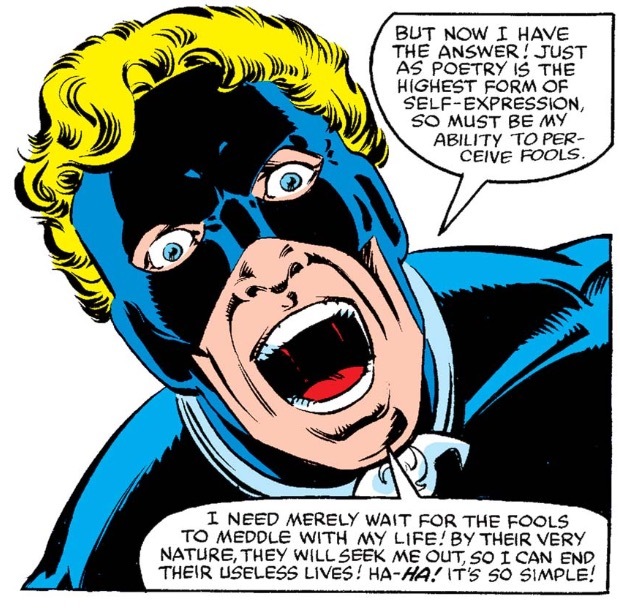 Not bad at all, even if “Foolkiller” regardless of characterization and design, is one of the silliest names for a comic book villain I’ve ever heard (he was created by Steve Gerber of Howard the Duck fame, so one must wonder if the name is intentionally bad). The character’s motivation for evil-doing is pretty straightforward as he is derived from the book of “villain is convinced that the bad stuff he’s doing is actually good,” adding some much-needed nuance and depth. Beyond that we still have no explanation for his penchant for dressing like an Errol Flynn cosplayer, but that’s neither here nor there (more cliches!). However, Stern being Stern, he manages to truly surprise me in how he frames this storyline, smartly casting the Foolkiller as Gregory Salinger, an otherwise mild-mannered Empire State University student in one of Peter Parker’s classes who is secretly a tight bundle of stress and nerves that lashes out very violently against anyone he deems to be working against his best interests. 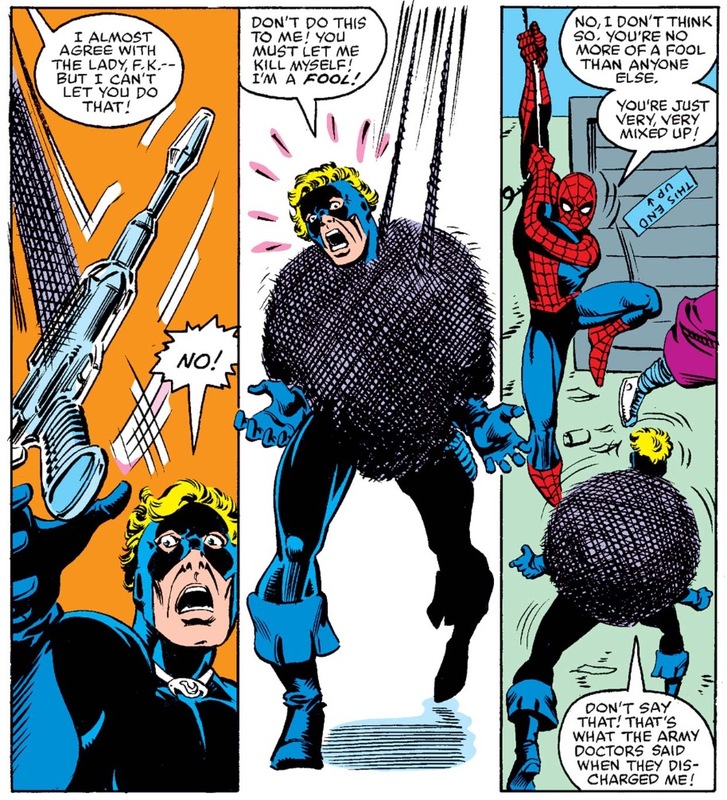 He’s got some kind of space zapper that turns people into ash and dust which is absolutely odd and out of place for a Spidey comic, and yet I still find myself compelled by this issue every time I read it (which has now been a number of times since I kinda like it). Stern even does this thing where he has Peter’s Spider-sense go off for a few seconds when he sees Gregory (who is all riled up and ready to lash out at somebody), only to have the buzzing stop once Peter starts talking to the student and inadvertently “calming” him. So, lesson learned. Even when the villain on the front cover looks like Dodgeball’s Alan Tudyk, give the comic a chance (unless it features Demongoblin or Spidercide because those guys are the worst, sorry!). Hmm. Seems like it’d be good, plus it’s got the 2nd Foolkiller, which led directly to the 3rd. His recent mini-series from Max Bemis sure seems to shed light on his rationale and thought-process back then, so that might help a little to make sense of his actions here. The name Foolkiller comes from a 1965 western movie starring Anthony Perkins – it’s sort of a gothic folk tale with a child’s perspective. The “foolkiller” is a mythical giant, ax-wielding monster the boy learns of early in the movie (the legend also works in the film as a metaphor for the plight of Civil War veterans damaged by their military experiences). I’m pretty sure I read an essay written by Gerber where he cited the film as the inspiration for the villain’s name. I don’t remember if he provided any further details as to why. The film’s definitely not a comedy, though. The first Foolkiller (Gerber’s) had an origin that involved a faith healer. The movie includes an evangelical preacher (not a faith healer), but that’s the only vague similarity between the film and Gerber’s original Foolkiller, as far as I can tell.